Glad to be rid of them. Sales must be down for Asiana to stop publishing a printed version. Not surprising since we are in a recession. A £4.50 fashion magazine is a luxury for most not a necessity. Some of us don't have time to browse online & when you have a lot of login\passwords to remember another is not a priority. Where will I get the latest fashion news, pictures the online format will only work if they keep it up2date. Secondly the fashionfinder is great idea in principle but when I've searched & contacted the business with a query they are not so keen to help. Its a case of pop into our boutique & we will help you, shame I live a long distance from some of the places with fabulous outfits! I will miss it. 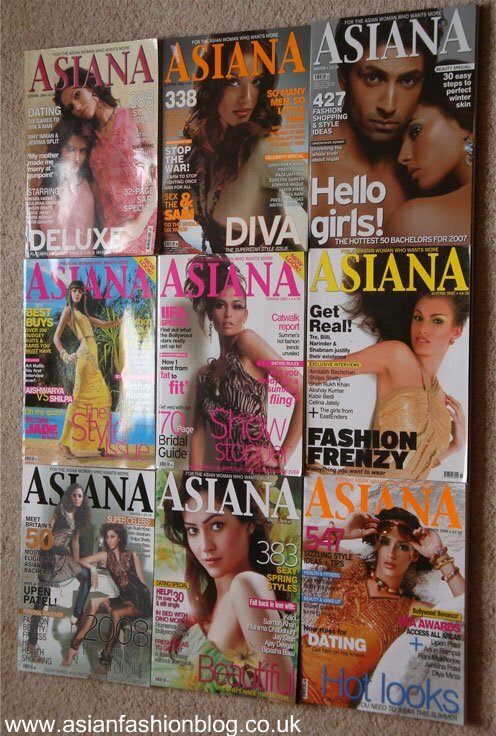 Asiana aims to be at the forefront of the publication and online arena. We believe the future is in online media, and in a time when the majority of us have internet access on the go due to innovations such as the iphone & ipad, restricting ourselves to hard copies would not be a development. The Fashion Finder is the first step in taking our fashion clients into the 21st century, and we have been the first Asian publication to modernise Asian fashion. 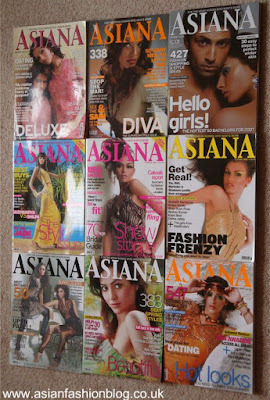 Hi Nazma, since i never read Asian mag, I won't miss it, and I guess the people at Asiana magazine felt the same. I do occasionally pop in to Asiana.tv, when i notice something interesting in their e-mail updates the come through my inbox. I am not a huge fan of online mags YET, but then again, i haven't purchased an ipad or any tablet yet, which is obviously the best way to look at the stuff. I have tried the fashion finder, and while it's not perfect yet, it's exactly the kind of thing I wished existed through all the weddings I've had to go to over the past ten years. Also, I am SOOOO glad they aren't getting rid of the wedding edition in print, since I buy that everytime I'm in the UK and sometimes even order copies to be sent to me here in Canada, as I hate the international edition. I think it's a freak shame, a lot of people prefer to see the printed magazine & keep it for reference. My mother reads my copies after me, she is not computer literate. I wonder if Asian woman will go the same way, such a shame. Just want to say this s a great blog, I follow it everyday , thank you for spending time and putting it together. Well, they claim that the future is in online media. Well not really. If that was the case, all the big fashion mags i.e vogue, company, harpers bazaar etc would have stopped printing. Asiana is clearly having difficulties, which they are trying to cover up for. Asian woman mag is doing perfectly well printing a fashion and wedding edition. Having said this, the loss of Asiana leaves a gap In the Market for another Asian fashion mag, so hopefully this will lead to something better. to be honest the recent issues of Asiana were crap anyway. No editorial content whatsoever, no good articles to read, just full of adverts and adverts. At the end of the day you want a magazine where you can read goof content too rather than just stare at pretty faces right? Asiana obviously lacked good writers so probably unable to do this, I don't think the ceasing of their publication or them going online will make any difference because it seems they lost a lot of readership anyway. I think people still like to buy magazines and hold them to read regardless of how techno savvy we become. i agree with the comment above, Vogue, Elle, Harpers Bazaar, Glamour and Asian Woman magazine seem to be still going on so its hard to believe that Asiana are closing down to concentrate on being online. Maybe they need to bring back a better Editor who knows how to write good material for it to have kept going! It is really bad that they stopped this publication ! I loved this magazine ! Hi everyone! I hear a new weekly FREE Asian newspaper is being launched very soon, maybe this summer. Has anyone heard anything? Apparently its similar to The Metro, they're printing an Asian newspaper called ASIAN CITY?